Coach Bob Hansen, right, and his victorious Slugs pose for a "national championship" photo. For the seventh time in school history, UCSC's men's tennis team has captured an NCAA national championship. The latest triumph occurred this afternoon when the Slugs defeated Amherst College 5-0. The 2009 NCAA Division III championships were played at Claremont College in Southern California. UCSC led 3-0 after the three doubles matches were completed, and they played their way to a 5-0 sweep with victories in the No. 1 and 5 singles matches. With a national championship clinched, the remaining four singles matches still in progress were suspended, though UCSC led in every one of them. 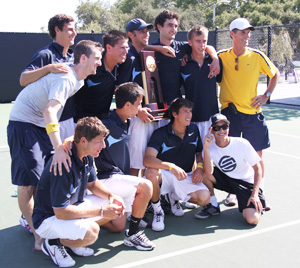 UCSC's tennis team also captured the Division III crown in 1989, 1995, 1996, 1998, 2005, and 2007; the 2005 title, contested on the Slug's East Field courts, was captured in front of home fans.